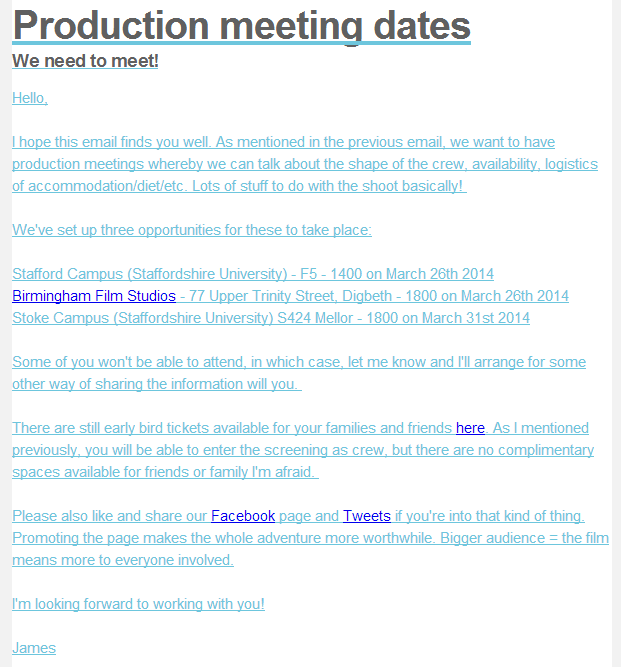 First Production Meeting for the 72hr Project, held in Staffordshire University, Stafford Campus. To discuss progress of the project and what to expect. So the crew could meet each other and decide what there focus areas would possibly be. So James Fair can see availability leading up to the project for rehearsals etc and peoples skills and possible groups. To fill out forms for foods, accommodation, travel, potential drivers and hoodies. To encourage social media sharing and more knowledge of the project and update on the current status of the project. Attending the meeting on time and discuss with James.